I wanted to stitch something to thank all the volunteers but unfortunately that’s too many people to personally stitch one for each person. 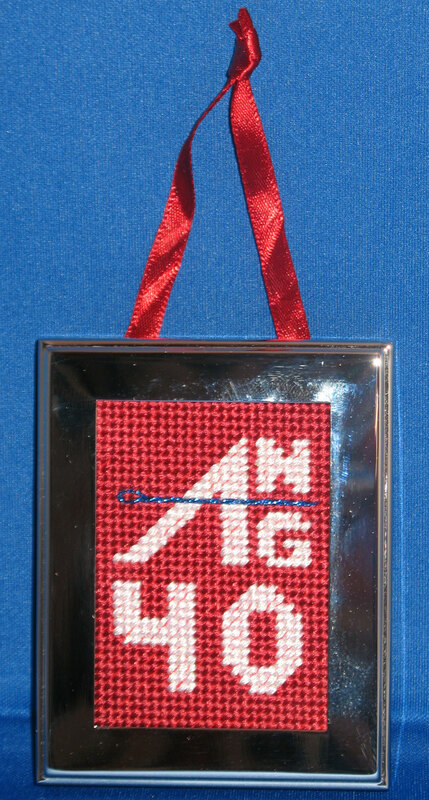 So, I decided to stitch one for each day & hold a daily drawing – one chance for every hour worked. This is for the Day 8 winner. It is a gold piece measuring 1&1/2″ diameter with a design area of 1″ diameter. I got it on eBay & placed a small magnet under a piece of red vinyl canvas (from crafterspride.com under fabrics) on the back to fit the space. I wanted to stitch something to thank all the volunteers but unfortunately that’s too many people to personally stitch one for each person. So, I decided to stitch one for each day & hold a daily drawing – one chance for every hour worked. This is for the Day 7 winner. 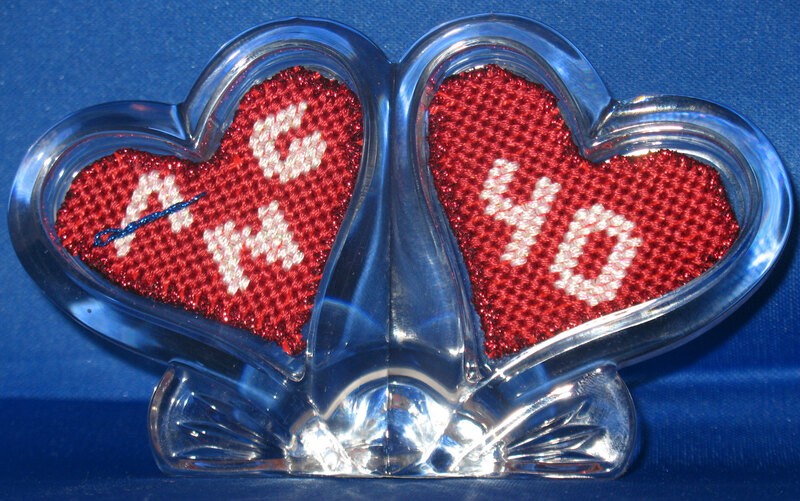 It is a double heart glass frame measuring (to be added later) designed it on 14 count red vinyl canvas (from crafterspride.com under fabrics) to fit the space. I like the vinyl because the edges don’t fray. I wanted to stitch something to thank all the volunteers but unfortunately that’s too many people to personally stitch one for each person. So, I decided to stitch one for each day & hold a daily drawing – one chance for every hour worked. This is for the Day 6 winner. 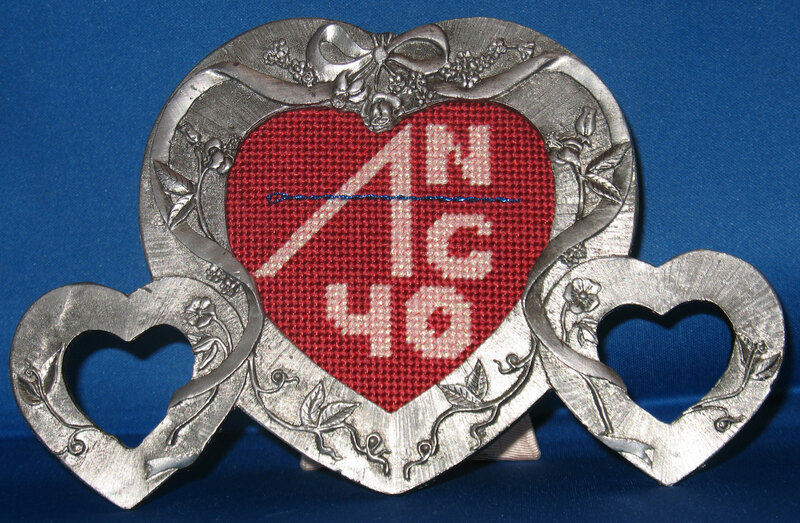 It is a silver frame with one large and smaller hearts measuring 5″ x 5″ with a design area of 3&1/4″ x 3&1/4″. I got the frame at a flea market & designed it on 14 count red vinyl canvas (from crafterspride.com under fabrics) to fit the space. I like the vinyl because the edges don’t fray. I wanted to stitch something to thank all the volunteers but unfortunately that’s too many people to personally stitch one for each person. So, I decided to stitch one for each day & hold a daily drawing – one chance for every hour worked. This is for the Day 5 winner. 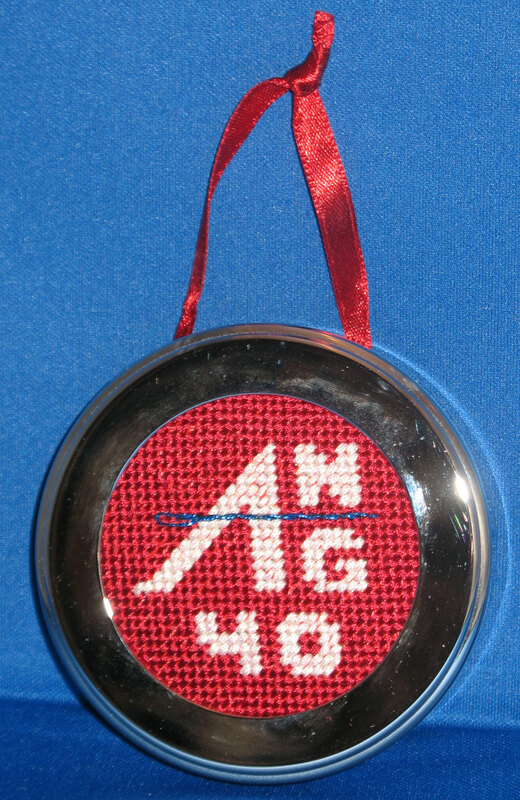 It is a silver ornament measuring 2&3/4″ x 3&1/2″ with a design area of 2″ x 2&1/2″. I got the ornament at Restoration Hardware & designed it on 14 count red vinyl canvas (from crafterspride.com under fabrics) to fit the space. I like the vinyl because the edges don’t fray. I wanted to stitch something to thank all the volunteers but unfortunately that’s too many people to personally stitch one for each person. 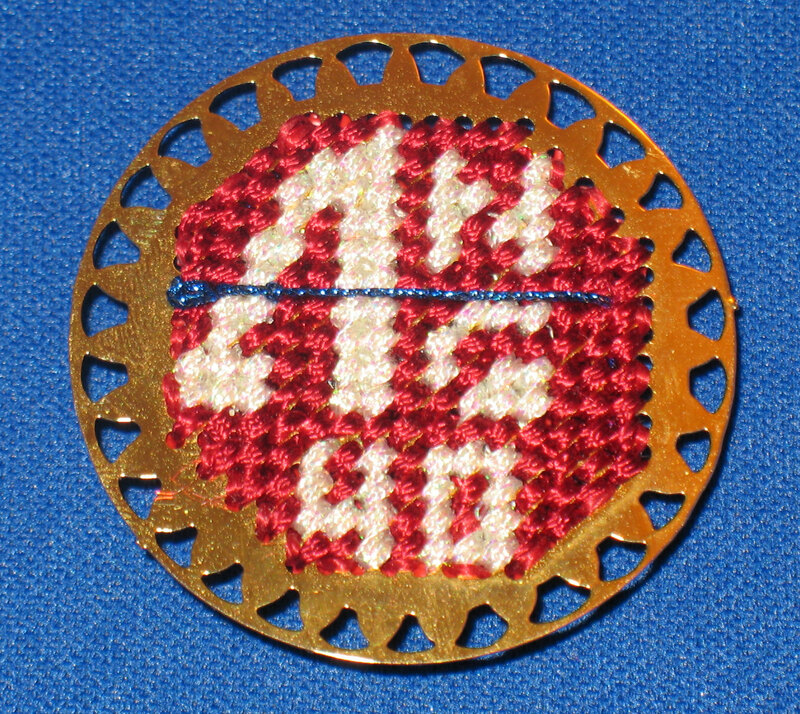 So, I decided to stitch one for each day & hold a daily drawing – one chance for every hour worked. This is for the Day 4 winner. 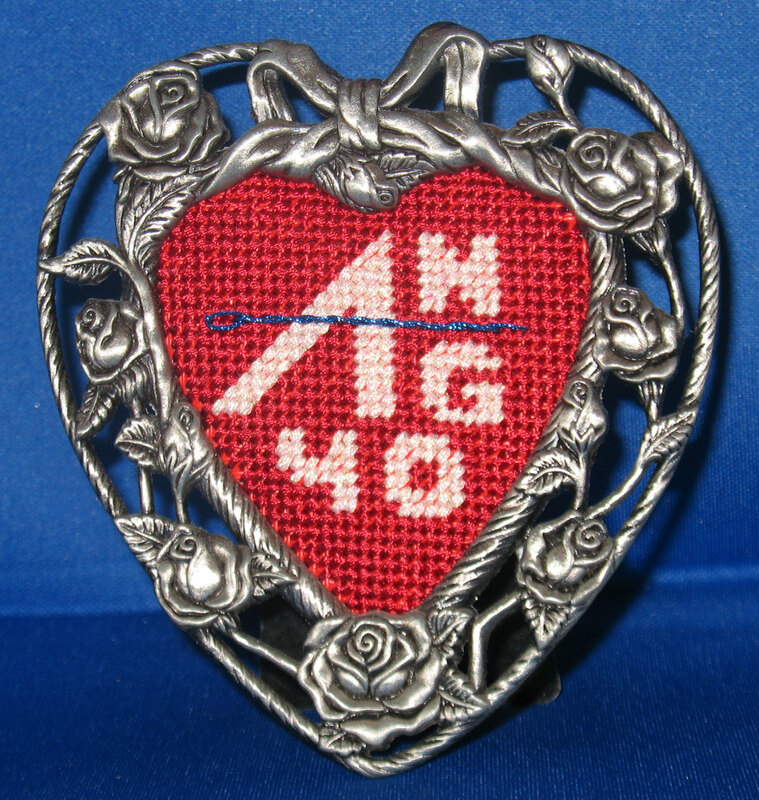 It is a silver ornament measuring 3″ diameter with a design area of 2&1/4″ diameter. I got the ornament at Restoration Hardware & designed it on 14 count red vinyl canvas (from crafterspride.com under fabrics) to fit the space. I like the vinyl because the edges don’t fray. I wanted to stitch something to thank all the volunteers but unfortunately that’s too many people to personally stitch one for each person. So, I decided to stitch one for each day & hold a daily drawing – one chance for every hour worked. This is for the Day 3 winner. 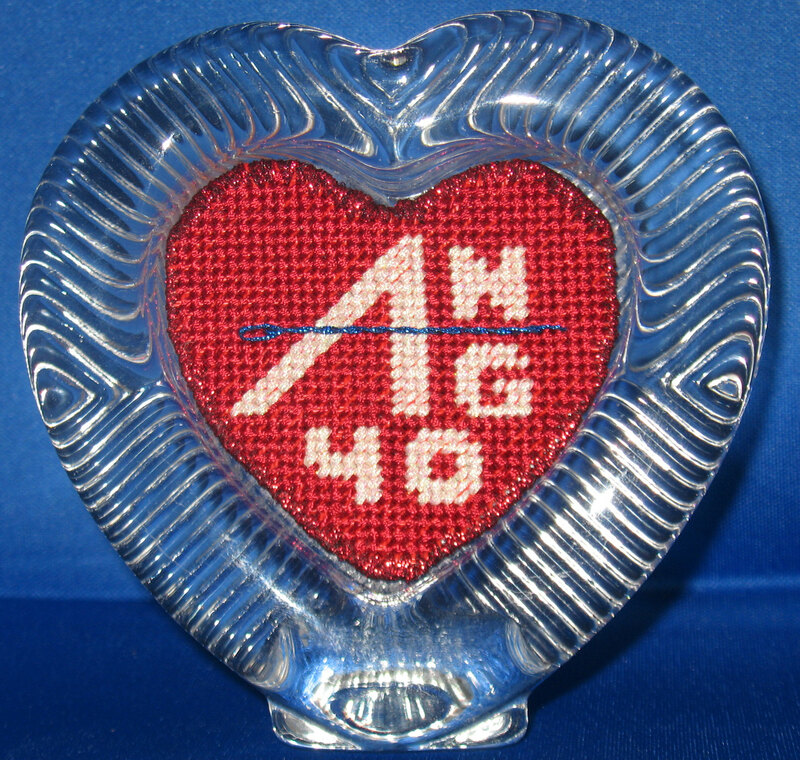 It is a glass frame measuring 4&1/4″ x 4&1/4″ with a design area of 2&3/4″ x 2&1/2″. I got the frame on a sale table somewhere & designed it on 14 count red vinyl canvas (from crafterspride.com under fabrics) to fit the space. I like the vinyl because the edges don’t fray. I wanted to stitch something to thank all the volunteers but unfortunately that’s too many people to personally stitch one for each person. So, I decided to stitch one for each day & hold a daily drawing – one chance for every hour worked. This is for the Day 2 winner. It is a silver frame measuring 3&1/2″ x 4″ with a design area of 2&1/4″ x 2&1/2″. I got the frame at a flea market & designed it on 14 count red vinyl canvas (from crafterspride.com under fabrics) to fit the space. I like the vinyl because the edges don’t fray.